Many bibliocentric (bible-centered) folks sometimes, of which I can say I am one, fancy themselves as something other than a theologian. They believe their musings to be scriptural rather than theological as though that distinction could be made. This, they believe, gives them a leg up and gives them advantage over theologians because they are not bound to any traditional obligations or logical/philosophical systematic connections, instead they are free to read the Bible "for what it says." It is true that one might not have to have a very clean-cut systematic theology, that they are at some level capable of going to the text as it is without forcing it to conform to their theological commitments. But this whole discussion takes us back to the basics of hermeneutics. Everyone approaches the text, no matter what text it may be, having been shaped by their experience, their education, and even their emotions and thus are viewing the text through the lens of their experience, education, and emotions. There is no escaping this reality, there is no realm beyond interpretation (we are always interpreting... see chapter 2 of James K. A. Smith's Who's Afraid of Postmodernism?). 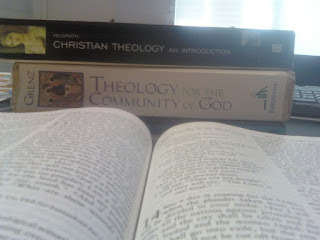 So where does theology come in? Theology is one of the greatest and most important of our lenses, ways we have been shaped and conditioned toward coming to conclusions, and it is one we have to recognize when approaching the text. No one is free from their theology whether it be thoroughly systematic, thoroughly un-systematic, highly illogical (which I am sure all of my atheist friends would accuse any Christian theism of being), accidental, unintentional, obliged to tradition, down to earth, or up in the sky. When we read the word "God" a plethora of definitions and presuppositions race to the forefront of our imagination. It is the same with when we read "Jesus." So imagine how complicated it gets when we read something as loaded as, "Jesus turned and said to Peter, 'Get behind me, Satan! You are a stumbling block to me; you do not have in mind the things of God, but the things of men.'" Before we can even utter the semblance of an interpretation, before we even begin to think about the passage in any sophisticated way, our understanding has already been shaped and aimed in the directions of our theology. It will either ring with depth of meaning, push us to question, or leave us dumbfounded depending on theology. This is true even of the original audience so why would it not be true for us? So the real question is are we ready to approach the text? Not "are we smart enough?" Not, "have we laid out our theology systematically enough?" But, are we ready? Does our theology leave room for us to approach the text with honesty? or does it corner us into dishonesty and indifference? I really like this, Wes.